In a post-Goop world, the pressure is on for Hollywood actresses to helm their own mini-lifestyle empires. There’s Reese Witherspoon’s Draper James, Jessica Alba’s Honest Beauty, Blake Lively’s ill-fated Preserve. Why just act when you can also have a beauty line, a shoe collection, and an all-organic soap store? Drew Barrymore launched her FLOWER beauty collection in 2013, which you can pick up easily at your local Walmart. 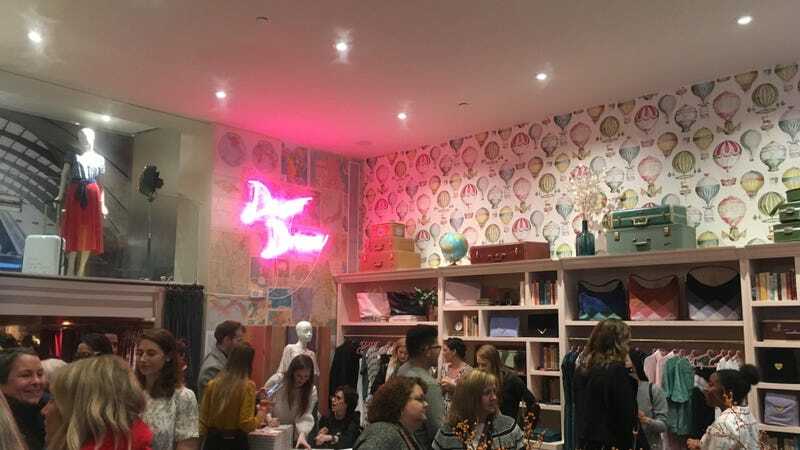 But her latest venture is the slightly more upscale Dear Drew, a line of clothing, accessories, and hair styling tools she’s made in partnership with Amazon, and during the holiday season she’s opened up a pop-up in SoHo, Manhattan. So I made my way over, in the middle of Saturday’s snowfall, to the tiny shop where Dear Drew has currently taken over, to eat very tiny foods among very stylish people. I’ll say first that the Dear Drew pop-up shop was a minefield of whimsy. The store looked like it was designed by Wes Anderson: the walls were lined with wallpaper covered in illustrations of old-timey hot air balloons, and typewriters and old suitcases are strewn everywhere. (Before I arrived, I read that most of the furniture in the store is actually Barrymore’s.) In one corner sat Darcy Miller, the famous editor-at-large for Martha Stewart Weddings, signing copies of her book Celebrate Everything! Upon entering, I was greeted by a cheery hostess who serves me a small slab of tuna on an even smaller slab of black rice, which looked like something I’d eat at the American Girl Doll version of Nobu. Little did I know I would eat several doll snacks throughout my time there. I move to the clothes. It’s hard to say exactly what the style direction of Dear Drew is. There were mannequins in the store styled up like ’60s Pan Am flight attendants, with red scarves around their necks and suitcases. Hearts are the unofficial logo for Dear Drew and appear everywhere, monogrammed onto dresses and bags. I pulled out a blue sweatshirt that said, “I perhaps owe having become a painter to flowers,” a quote from Impressionist painter Claude Monet. Another skirt was printed with handwritten phrases that say “Get lost to get found” and “Stay in love with the unknown.” I pulled aside one dress in a baby blue, ’40s style which I might actually wear, and note its $188 price tag. Everything was vaguely vintage inspired, vaguely French, and vaguely... poetic. I also suspected that I was supposed to feel empowered by the merchandise, as evidenced by a still life of hair styling tool boxes in the back of the store that read “YOU ARE POWERFUL” and “YOU ARE ADVENTUROUS.” Barrymore has said that Dear Drew is supposed to be “a love letter to all women around the world” and so I imagine hearing these boxes’ compliments in her voice. Another clutch tells me “You are strong,” which is polite of the clutch considering I would probably lose it one night after three drinks and two bar transfers. Writing, particularly letter writing on vintage Air Mail paper (you know the kind, with the red and white border) seemed to be a common thread in the store and the collection. And when I made my way through the space I am somehow not at all surprised to find two good-looking people typing free haikus on vintage typewriters. I asked Lisa, who explained that she’s from the poetry collective Haiku Guys, to write me a haiku about feeling anxious in the year 2017. After asking me if I’m okay, she handed me a poem about butterflies. Munching on a vanilla cake pop covered in silver glitter, which I did not take a picture of because I ate it too quickly, I felt moved. In addition to the haiku station, there was also a craft table where people (mostly children) were creating paper snowmen and writing holiday cards for children at the Sloan Kettering Cancer Center. A photo booth in the corner was set up, where pictures taken with a digital camera were printed out to look like Polaroids. Another young woman in Dear Drew merch moving past me asked, “Grilled cheese?” But what she offered looks like a crouton with a cherry tomato slice on it. “It’s filled with the cheese,” another woman chimes in, out of nowhere. The entire Dear Drew shop was filled with old-school, analog paraphernalia, which is kind of funny when you remember that this it’s actually an Amazon clothing line. “They are the current and they are the future,” Barrymore recently told Women’s Wear Daily about the choice to partner with the conglomerate. And if there’s one thing the shop does really well, it’s that it makes you forget that you’re shopping Amazon products; it felt like just another tiny, chic store on the same street as Rachel Comey and Reformation. Amazon is putting a considerable amount of effort into their clothing lines and they’re doing really well. But even though brick-and-mortar stores are dying left and right, Amazon is savvy enough to know it can benefit from experiences like the Dear Drew pop-up, particularly for their more expensive lines. By the time I left, I was confident that Dear Drew will do well—and even more confident that shopping for clothes through Amazon pop-ups designed to look like vintage boutiques are our future. Oh, and here’s my craft! Correction: A previous version of this post incorrectly identified Darcy Miller’s last name. Jezebel regrets the error.